I really should write so much more in this post, but I'm backdating it since I've been a non-blogger for so long that I've been having trouble keeping up. So here is the short version. Be sure to click on the image link to see the entire photo album! Over Christmas this year, I went to the Bahamas with my dear friends Jeff and Allison. We went down to enjoy our Christmas with Allison's biological dad down there. And really, the Bahamas are simple to describe... PARADISE! I'm still not quite sure why I came back to the states!? 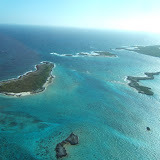 It was an unbelievable vacation on Staniel Cay mostly, but other islands as well. I don't know how we could have packed in more fun, but I think I'd like to try! We went snorkeling with sharks, jet skiing, hiking on Lumber Cay, where they have big plans, fishing/trolling (we caught a Baracuda), drinking, dancing, swimming on the most gorgeous beaches ever! I even played a gig at the Yacht Club on Staniel Cay. There is so much that I can't even begin to tell you about it... and that's why you only get the short version. Just see the photos, they'll tell you a story for sure.